1) Introduce followers to inspiring stories as told by chefs, wine makers, sommeliers, and wine merchants in California with tips to other wine and foodie stops in Italy and France. These tales are not meant to boast of their accomplishments but to share behind-the-scenes accounts of their journeys, both struggles and triumphs. 2) Provide travel tips, plans and opportunities for culinary food and wine adventures from California, including the Central Coast (Paso Robles to Santa Barbara), Napa, Sonoma, Lodi as well as wine regions in France and Italy. 3) Investigate, taste and review wines from California, Oregon, Italy and France, passing along my findings to those who follow. 4) Create, demonstrate and encourage wine pairings and recipes that a home cook can create and serve confidently as a host to both family and friends. 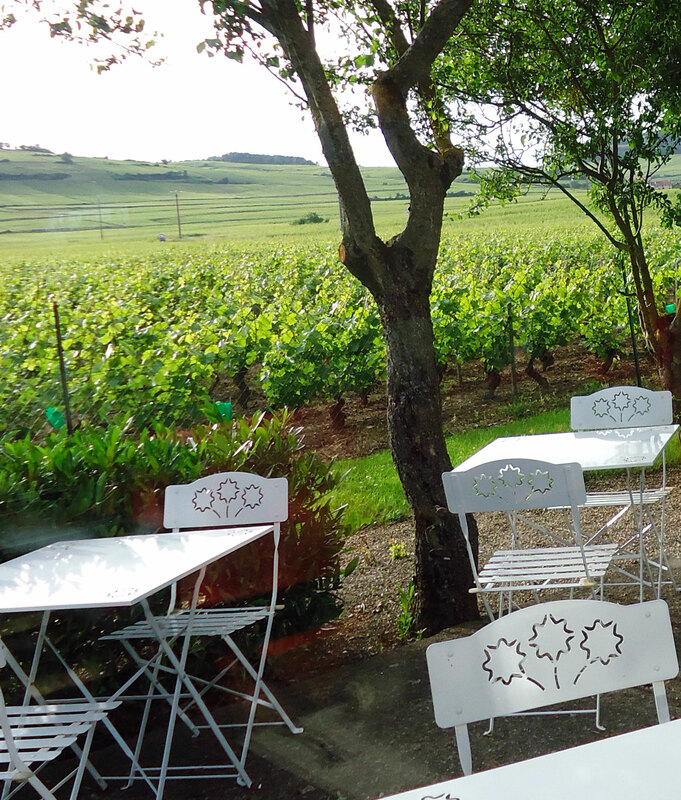 While restaurant Auberge des Vignes is on the R74 at the edge of Volnay, its quiet garden seating overlooks the vineyards of Pommard and Volnay, Burgundy. Blog posts while not consistent yet are planned for each week. The hope is to create a place where home cooked meals, visits to wineries and area foodie stops create weekly posts as Geena and I share our wine and foodie journey. TalesoftheCork also welcomes comments, emails, tweets and suggestions for future stories and culinary adventures. Thanks for visiting TalesoftheCork; we look forward to sharing wine, food and travel experiences with you. Greg has been a journalism adviser and an educational tour guide to France and Italy for 20 years. But as I travel across Europe, I am less consumed with repeat visits to tourist sites and more with those who make the region their home. Relationships with the people who create culture are at the heart of my vision as I partner with wine and food connoisseurs both in California and stops along the way.